And of course in the best quality available. At ProX you will only find the top quality brands from Japan like KOYO, NTN, HIC, MBS, etc. This will enable you to rebuild your specific assembly to, reliable and as new specifications. High output engines require high end parts. For these specific engines, like motocross and ATV engines we offer flat silver big end cages. 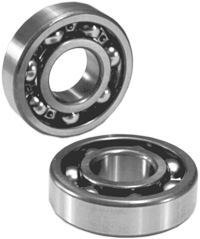 These bearings are able to cope with the high rpm’s of these applications. For all other applications we offer high quality M-style cages. ProX offers a wide range of crankshaft bearing of well known brands like Koyo, NTN, etc in C3 and C4 graduations. 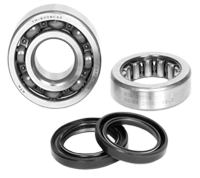 The high quality bearings will fit perfectly to OEM and aftermarket crankshafts. ProX crankshaft bearings are manufactured at leading OEM factories, mainly in Japan. 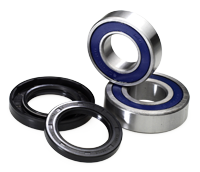 All bearings are made to exact OEM specifications, to ensure maximum quality and performance. ProX uses respected brands like Koyo & NTN to ensure quality. These brands are used by OEM brands like Yamaha, Kawasaki, Honda, Suzuki and KTM. ProX bearings offer high durability. Take the easy route: ProX Crankshaft Bearing & Seal Kits offer you reliability and carefree driving. The sets contain all parts you need for rebuilding your crankshaft and can be used in combination with all other ProX or OEM crankshaft related products. Next to the high quality ProX connecting rod kits the Crankshaft Bearing & Seal Kits are completing the crankshaft parts program. ProX offers a complete line of piston pin bearings for the Dirtbike, ATV, PWC and 50cc/scooter segment. The pistons pin bearings are manufactured by the leading Japanese OEM factories. All pistons pin bearings are designed and developed to OEM specifications and are a direct and cost efficient OEM replacement. Full line of piston pin bearings for Dirtbike, ATV, PWC and 50cc/scooter available from ready stock. 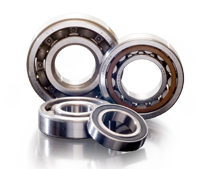 Maintain your wheel centers with wheel bearings offered by ProX. Our high quality, mainly Japanese bearings are a perfect match for your wheels. Offered as single or as set, just the way you want it. Rear shock bearings need to be maintained frequently. ProX offers a wide range of Rear shock bearing for Dirbike applications. • Comes with needle bearing, cup seal and bushing. The ProX Wheel Spacer Kit is a complete and direct replacement for the OEM parts. 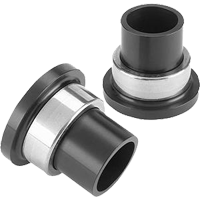 The ProX alloy spacers feature a hardened steel shell pressed over the alloy providing a superior wear surface and resulting in longer wheel spacer and bearing life.